I farm in my back yard in Gugulethu, where I have all kinds of seasonal vegetables, ducks, chickens that lay eggs and broilers, and a small vineyard. I also farm at Fezeka, where I have a tunnel and a piece of land that helps produce a wonderful crop of tomatoes, basil and many other vegetables throughout the year. I grow organic vegetables and herbs for food for the community, as well as for a wider market. 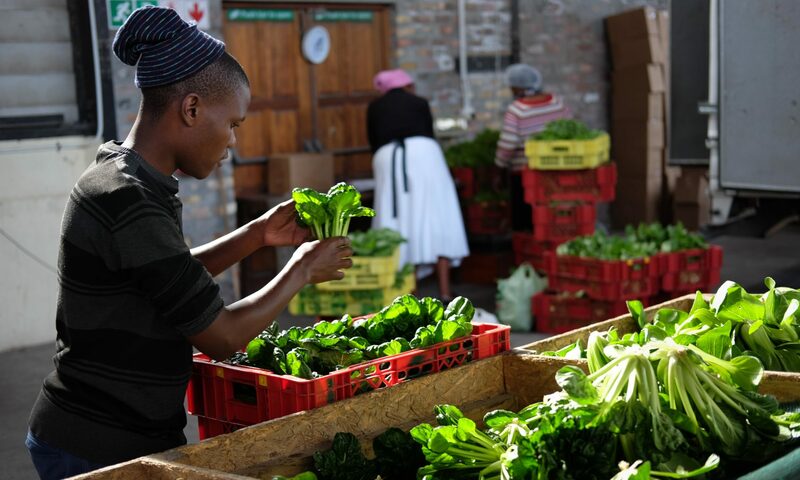 I sell my vegetables to a number of markets – including Abalimi Bezekhaya – one of my oldest supporters. Abalimi taught me a lot and introduced me to other farmers doing the same thing as me. I believe in the strength of us farmers working together to improve our lives as farmers. I also want to use my garden to educate the youth of Gugulethu, and give them a skills set to get them off the streets and out of gangs. I have many dreams of growing more vegetables, rearing more chickens, growing fruit, and many other things. I want to increase my compost pile, start a worm farm and use Bokashi to make more compost. I have also thought about starting a mushroom farm. These are a few of my plans and dreams. Our biggest challenge is infrastructure. We are always struggling with boreholes and water, irrigation pipes and security for our equipment. We know how to do the rest, we can grow anything in our sandy soil of Gugulethu, but we cannot build our infrastructure as it needs capital. This is where we need help. Please contact me if you would like to discuss ways of supporting me or collaborating with me. Fezeka Garden, Fezeka Municipality, Steve Biko Drive, Gugulethu. Click here for a map to Fezeka Garden.